The Library occupies the four lowest floors of the SSEES building in Taviton Street. The entrance to the Library and the Library Help Desk are located on the Ground Floor, while the main reading areas are on the Lower Ground, First and Second Floors. You may work in whichever part of the Library you find most comfortable. You may take books and periodicals from one floor to another, but please leave them on one of the shelving trolleys when you have finished with them, not on a desk or back on the shelves. There is a 24-Hour Reservation Shelf on the Lower Ground Floor where you may reserve books for further use. The information in this section will provide you with the basics of the Library. UCL SSEES Library has 24-hour opening during term-time and most of the Easter Vacation. We are open 24/7 during Term 3. Over the summer we are open 10:00-19:00, Mondays-Fridays, and 10:00-17:00 on Saturdays. UCL SSEES Library is open 24/7 throughout the Easter vacation. There are no staffed services over the Easter weekend itself, but the Library will be open to existing card holders at all times, with self-service borrowing and returning available. 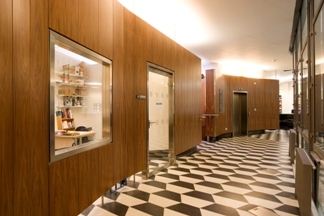 Full details of opening arrangements for all UCL libraries are available at UCL Library Services. There may be exceptional circumstances when the Library needs to close unexpectedly. In order to stay up-to-date, follow us on Twitter @UCLSSEESLibrary or on our Facebook page. Please feel free to ask any member of library staff for help, and we will be happy to provide it. There is a Help Desk on the Ground Floor of the Library. You are also welcome to come into the staff offices on the Ground, First and Second Floors of the Library, or feel free to approach any one of us who is walking around. Here is a full list of UCL SSEES Library staff. UCL Campus Maps - Search or browse UCL locations and find directions to and from any building on campus. Cycling: There are bike racks right in front of our building where you can secure your bike and also a docking station for Santander Cycle Hire Scheme bikes. The Library occupies the bottom four floors of the UCL SSEES building, with the entrance on the Ground Floor. UCL SSEES Library is accessible to readers with disabilities. There is a ramp at the entrance to the building and a lift within the Library. There are also two height-adjustable desks located in the Current Periodicals section on the Lower Ground Floor. Library Services offers a range of other facilities for users with disabilities. Please help us make the Library a comfortable place for all students to study. You will be asked to move to the Ground Floor if you are disturbing other people by talking. Mobile phones must be switched off or set to silent in all the public areas apart from the Ground Floor and the staircases from First to Second. You are welcome to bring your own hot or cold drinks in closed containers into the Library, but for the comfort of all users food is not permitted. A drinking fountain is provided on the Lower Ground Floor, where you may refill water bottles. Be very careful of your own property while you are in the Library and do not leave valuables unattended. If you do leave something behind, there is a Lost and Found box at the Help Desk. If you see anybody acting suspiciously or damaging library property, please report the incident to a member of library staff immediately. UCL SSEES Library is open to all UCL students and staff who have a valid UCL ID card. Academic staff and research postgraduates from UK and overseas universities are entitled to free reference access to the Library, as are all current students from University of London institutions. Restrictions apply to undergraduates and taught postgraduates from LSE, City and SOAS during Term 3. Taught postgraduates and undergraduates from other British universities which participate in the SCONUL Summer Vacation Scheme are admitted free of charge during UCL's summer vacation, but must pay a fee during term-time and during winter or spring vacations. Members of the public and some other categories of visitor have to pay a fee to use the Library. A day ticket costs £7. Weekly and monthly tickets are also available. External visitors should report to the membership point just inside the Library entrance. You will need to fill in a short application form and supply details of your status before you are issued with a Library card. Please bring photographic proof of ID with you, such as a driving licence or passport, and also some proof of your home address, such as a bank statement or utility bill. If paying for membership, you also need to bring cash with you as we are unable to accept card payments. Due to exceptional demands on our services during UCL's examination period we will not be accepting applications from paying reference users / members of the public from Tuesday 23rd April until Friday 7th June 2019. Please contact ssees-library@ucl.ac.uk for further information. Restrictions also apply to undergraduates and taught postgraduates from LSE, City and SOAS during Term 3. Free borrowing (5 standard loan books) is available to UK/Irish academic staff and research students, provided their home institution is a participant in the SCONUL Access scheme. Users must complete the online form on the SCONUL website and have their application approved by their home institution library, prior to requesting borrowing access at UCL. Private scholar borrowing (3 standard loan books) is available to members of the public for an annual fee. If you would like more information on Library membership, please contact the Library Manager, Gillian Long, e-mail: ssees-library@ucl.ac.uk, tel: 020 7679 8704, int. 28704.